Canadian Wildlife Federation: How many venomous snakes are there in Canada, and what should I do if I run into one? How many venomous snakes are there in Canada, and what should I do if I run into one? Found in interior British Columbia, this snake can measure more than 1.6 metres in length. They prefer short-grass prairie and dry, open scrubland. 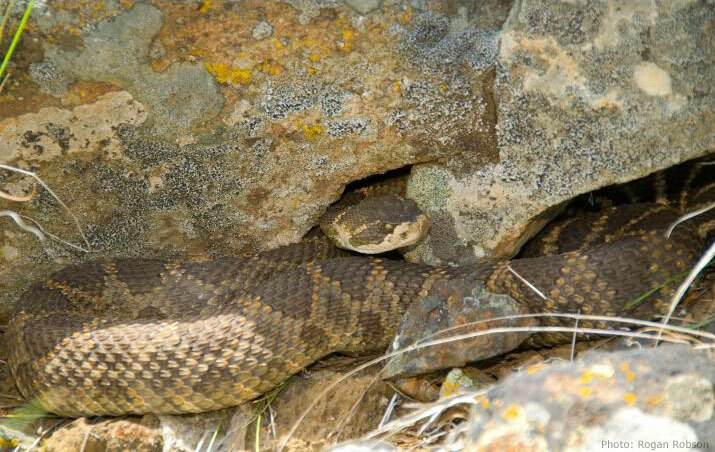 When disturbed, Northern Pacific rattlesnakes defend themselves by coiling, vibrating their rattle and striking. While their bites are seldom fatal, you should always be cautious when around these snakes. Primarily limited to the Georgian Bay area of Ontario, Massasaugas seldom grow longer than 75 centimetres. They are commonly found near water. They are not an aggressive snake by nature and will often remain motionless if someone walks by. However, they will coil and can strike if they feel threatened. Limited to a small portion of southern British Columbia, this snake typically measures between 25.5 centimetres and 53 centimetres in length. They like hot, dry areas and, as their name suggests, they are active mainly at night and are therefore seldom seen. Their saliva is slightly toxic, so take care if you happen upon one.